Soy Salmon Fish - A Perfect Summer Dish! Salmon is one of the best types of fish you can eat, as it is rich in Omega 3, a nutrient that helps brain function and your nervous system. Fats found in salmon are responsible for many cardiovascular benefits and when eaten two to three times per week, salmon can protect you from problems such as heart attack, stroke, arrhythmia and high blood pressure. There aren’t too many foods which bring such positive benefits to your diet. What’s more, it is totally delicious too. This simple recipe is a quick option for dinner, perfect for a sunny summer evening or to complement a barbeque. Preheat the oven to 180°C/gas mark 6. Grab a bowl and stir together the soy sauce, garlic, ginger, honey and lime. Pour over the salmon and leave to marinate for a short while, if you can. Lift the salmon from the bowl and place in parchment or foil, spoon over the marinade and twist or fold into a parcel. Place on a flat oven tray and bake for 12-15 minutes. Meanwhile, make the coleslaw by stirring together all of the ingredients. Using a food processor makes this within seconds but chopping and or hand grating is just as good. 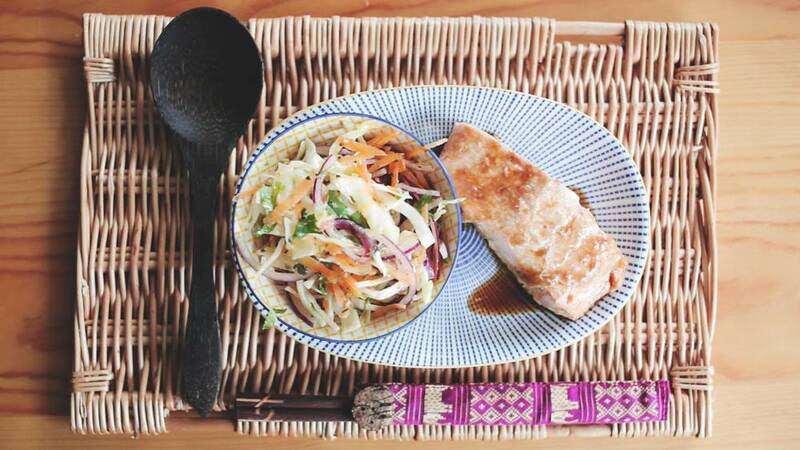 Serve the salmon with spoonfuls of coleslaw and wedges of lime. Here is our snappy video on how to make this dish.